Music can be the best part of your life when you have spare time and nothing to do. Today, there are the better ways through which you can listen to the music and to kill your spare time. With the introduction of the smartphones such as Samsung Galaxy S7 and Galaxy S7 Edge, listening to music has become more easy and popular even if you do not know about the song name. These smartphones provides us with the platforms available for the Operating Systems to listen to music without any hassle. So here, I am going to provide you with such platforms that not only enable us to listen to music but also allow us to track the songs with its lyrics and that comes out on the top on the ratings of Play Store. We will also cover Best Music Player Apps For Samsung Galaxy S7 And Edge. If you want to use Dual Stereo Speakers for Music on your Samsung Galaxy S7 or Galaxy S7 Edge, make sure to read this guide. 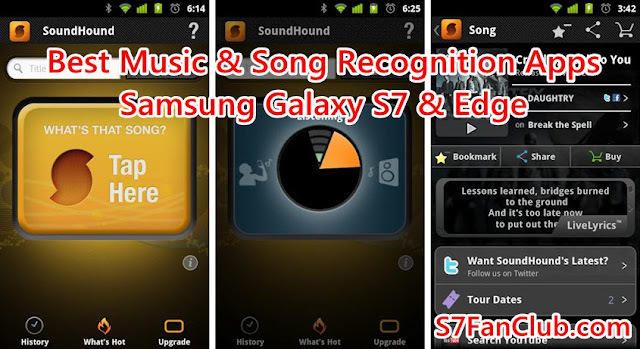 Have a look at the top Samsung Galaxy S7 and Galaxy S7 Edge Music Recognition apps that have revolutionized the world of music. This one is probably the best music recognition app on the Play store that is the multi- feature music app as it includes both lyrics identification and music recognition. This one is the must have application is it is flooded with the number of features that a Music Galaxy S7 app should have. Apart from its features, the app has its own built- in player through which you can manage your playlist, music library and favorites. Next on the list is another amazing Music Recognition app that is having the fan following of millions of people all across the globe. With this app, you can now search over millions of songs with its synced lyrics. Get the facts behind the sound track and increase your knowledge of music with this amazing application on the Play Store. For all this, you just need to download the free version of this app on your galaxy S7. Now recognize millions of the songs on your Galaxy S7 with this amazing Music Recognition App that is called as TrackID. Through this application, you can instantly identify your song for you. apart from its typical music recognition features, this app also allows you to share your music with your friends and family on the social media sites like Facebook by just hitting the like button on the song. With this, you can also get the song facts, the biographies of the artists and much more with this app. So this app is worth trying if you are in need of something musical. This app is not less than that Marvel superhero named Shazam. As being the music recognition app, this offers the unlimited features to recognize the song that you want immediately. With the feature of previewing the song for 30 seconds, you can have the option to download that specific song on your mobile device. The best part of this application is that you can even identify your music when you are offline and not connected to internet. No doubt, Sound Hound is one of the most popular and recognized music recognition applications on the Play store that comes with the number of unique features. The major reason of its popularity is not unknown by the people that it is the fastest music recognition platform that allows you to identify your song within a matter of seconds. The best feature of this app is that it can even identify the song when someone sings or hums it. 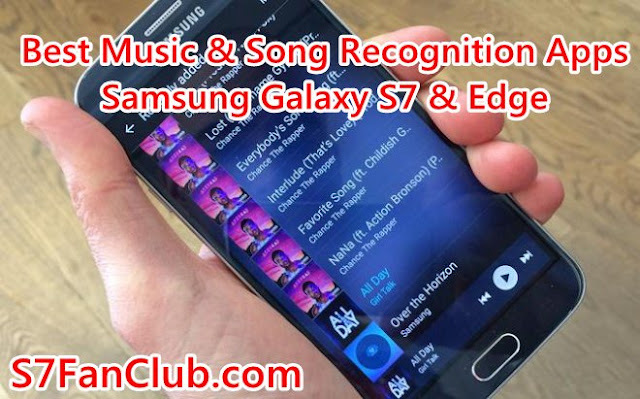 Now with these Galaxy S7 Music Recognition apps, you can just answer the question of “What’s that Song?” you can use the above listed songs recognition apps to amaze your friends and family.